The Internal Revenue Service (IRS) recently issued informational letters regarding employer responsibilities under the Affordable Care Act (ACA), reminding employers that reporting offers of health coverage is still required. Applicable large employers (ALE), defined as employers with an average of at least 50 full-time employees (including full-time equivalent employees) during the preceding calendar year, must provide information regarding health insurance coverage offered to employees. Large employers are required to report whether they offered coverage to employees and what kind of coverage was offered. The information must be filed with the IRS using Form 1094-C, and Form 1095-C. The IRS uses the information to determine whether an ALE owes a payment under the employer shared responsibility provisions of the ACA and whether employees are eligible for a tax credit. Small employers are not subject to the shared responsibility provisions (the “play or pay” mandate). However, small employers that sponsor self-insured group health plans must still file using Forms 1094-B and 1095-B to report information about covered individuals. The filing deadline for filing 2017 information is February 28, 2018 if filing on paper, or April 2, 2018 if filing electronically (technically March 31, but that lands on a Saturday). Employers filing more than 250 forms must file electronically. Why the new emphasis to comply? This isn’t the first time the IRS has issued warnings to employers that penalties could be imposed for noncompliance. Even with such warnings, however, the IRS has not issued any fines. That being the case, some employers have tabled the reporting requirements in hopes that the ACA would be changed or replaced. But, with the ACA repeal and replace conversations essentially over, at least for 2017, and the IRS’ announcement of its new ACA Compliance Validation System, now may be a good time for employers to ensure they are in compliance. The new ACA Compliance Validation System is a compliance tool for identifying potentially noncompliant employers. The tool can identify potentially noncompliant employers and will calculate the highest penalty under the law. In addition, the system allows the agency to send notices to noncompliant employers retroactively for all reporting years. The IRS estimates that it could recover $228 billion in ACA penalties, so shoring up your reporting responsibilities may be critical. For employers who have missed reporting deadlines, file your reports as soon as possible. Correcting the error shows a good faith effort to come into compliance, and may lessen the assessed penalty. 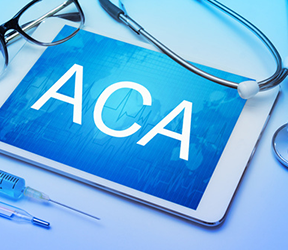 Employers who have put ACA reporting responsibilities on the back burner should be aware that the IRS is using a new system to identify those that are out of compliance. Click Here to take a free, no-obligation trial of the Bottomline Benefits & Compensation Newsletter.